The three semi finalists to join Mid Annandale in the last four of the Potts Cup competition are Newton Stewart, St Cuthbert Wanderers and Wigtown and Bladnoch. In the Potts Cup quarter final matches played on Saturday, May 5 the Creesiders recorded a 3-0 victory over Upper Annandale when striker Robert Middleton opened the scoring early in the match with a second coming from midfielder Robbie Thomson in the 28th minute to give the home side a comfortable half time lead. Marc Whyte ensured victory with a third goal just after the restart and although other goal chances fell to Newton they failed to add to their tally but ran out comfortable winners. 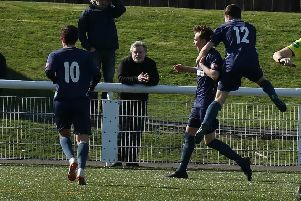 Saints scored four without reply against Nithsdale Wanderers to reverse the result from the previous week when the Sanquhar side came out on top while Wigtown also found the net four times in their match at Trammonford Park against Edusport Academy. Wigtown play Newton Stewart while Saints play Mids in the semi finals.